Hello my little Sweeties 💕 Not sure whether have you heard of the latest cushion makeup for hair?! When I saw the video from the social media I was like oh my god! Who created that and it's basically one of the latest trend in Korea. 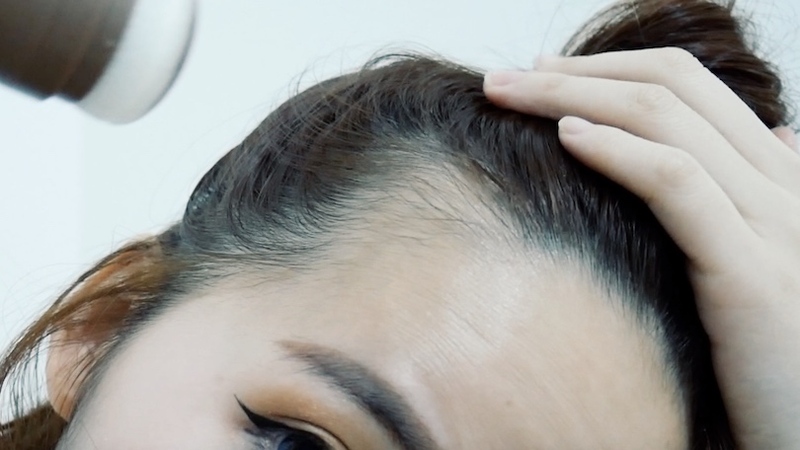 Most of the girl use this hair hack / trick to cover all the empty hairline on their hair and make it look like they have a very thick hair. Somehow, it volumize your hair too. So today, I'm going to share my tried and tested review on my blog. It's the Quick Hair Puff from THE FACE SHOP. 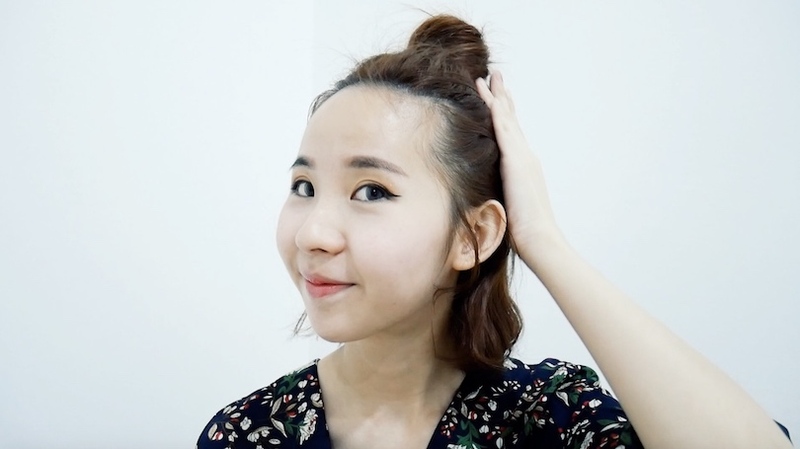 Yes, I heard of the hair makeup via using a eyeshadow or something like the pen wan but this is a HAIR PUFF. Something like a cushion. 😱 Wow, that's amazing and I even did a video tutorial for you guys to refer too. Finally I get to try this product and I'm really excited to share this with you because it solved my hairline problem and I'm not afraid to tie all my hair up anymore. Especially my fringe / bangs. So for this product, it's quite mini size but super powerful. Super easy to use and come with few colors. I get a dark brown and a natural brown for myself because not sure whether what kind of hair color I will go for when I receive this hair puff. But normally if you ask me to recommend you to get one only, then go for the natural brown while the dark brown is for people who normally dont dye their hair or having a super dark hair color. This hair puff able to give you a control on your hair line and the color is really natural. Not fake and if you use it in a correct way to correct your hair line, your face will look slimmer and not too big. So I normally use this to fill in the empty hairline on both side of my hair. Yes, I really don't know why I got that two empty space on my hair. When I tie all my all up included my fringe, this can be really obvious and somehow make my face look wider and just too ugly to show it. Or during the photoshoot or interview session (years ago) , makeup stylist will help me to cover it with a little bit of the eyeshadow. 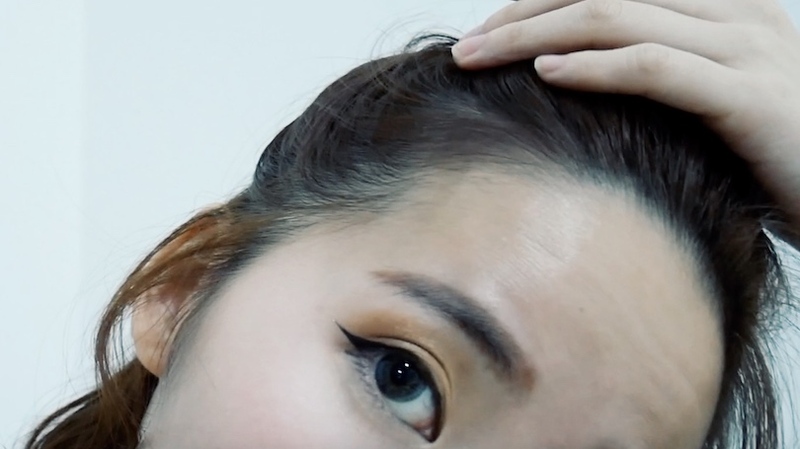 This two empty hairline are the reason why I always keep bangs so it can always hiding under my hair. But ever since I start to have long fringe, it's no longer a secret for me. 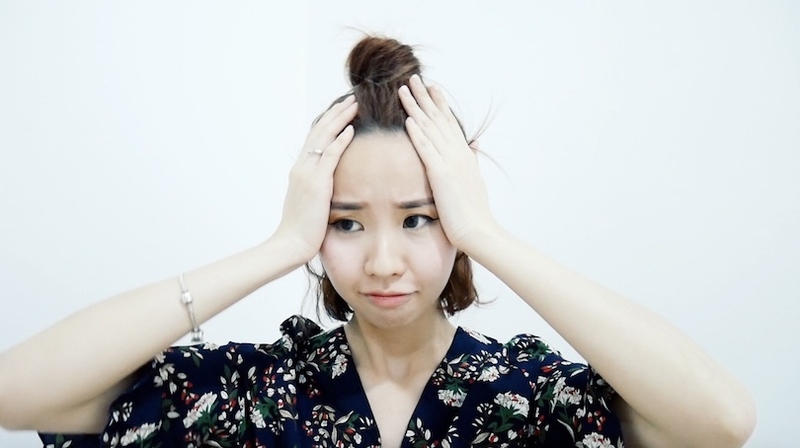 My friend always ask me whether I'm suffering hair loss or what. I don't even know why but this is a problem for me since years ago. 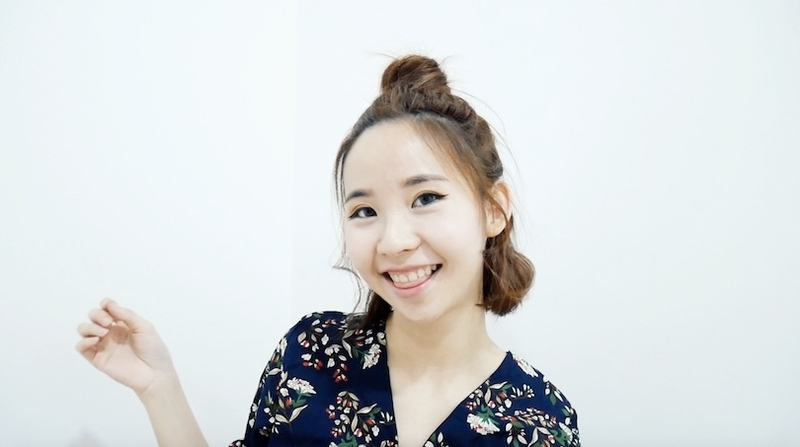 Korean girl who love to tie their all up into a big bun, they will always use this trick to make their hair look nicer, face slimmer and more volumize. 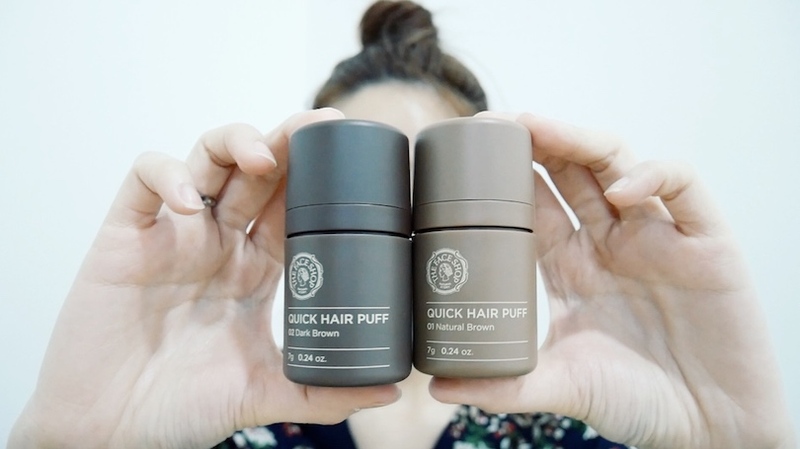 It's a new concept of hair makeup product that combines hair product with makeup cushion (puff) and this quick hair puff from THE FACE SHOP even has a small mirror on the top of the cover cap! Before using it, remember to take off the inner cap in the product. You need to remove it first before using it on your hair. Next, lightly pat on the bare areas by using the hair puff and slowly you can see the color appear and coming out from the puff. This natural brown color look really natural when you use it on our hair. It cover our hairline naturally and no worries for the product because it's a water-proof product that doesn't come off easily with water. Remember it's water-proof but not smudge proof so please dont keep rubbing your hair after using it. If not your fingers might get dirty after that. So now the question is, how to use it? Let me answer your question and provide the review for you with a proper before and after-use photo! It's super duper easy to use. Just remember to keep the product upright before using it to avoid the powder fly around or come out too much during the application. Before using the product, remember to pick the correct color that suit your hair color. I just place both color on my hair and see which suit me the best. My hair color is lighter than the dark brown, so I pick the natural brown instead of the dark brown one. If your thinning hairline is on top of your hair, you can use the dark brown color instead of the light one so that your hair can instantly look volumize within few seconds. #Chanwontips: For your fringe hairline I use natural brown. On the other hand for the top of your hair , near the hair root spot, you can use a dark brown instead. If you have super light hair color then get the lightest color to fill in your hairline. So this is my empty hairline problem lol. Very serious and almost like botak already lol. Just gently apply it on the thinning or receding hairline. Fill in all the empty spot like mine. See the color, it's so natural! Oh yea, remember to be careful not to get it on the clothes ya. The powder can fly around if you apply it too hard during the application. So here's the before and after photo! Instant result and it contains hair strengthening ingredient such as Ha-Soo-Oh/ black bean/ ginseng and it's a Paraben free product too. After the application, just let it be and enjoy the rest of your day with your super chio hair. 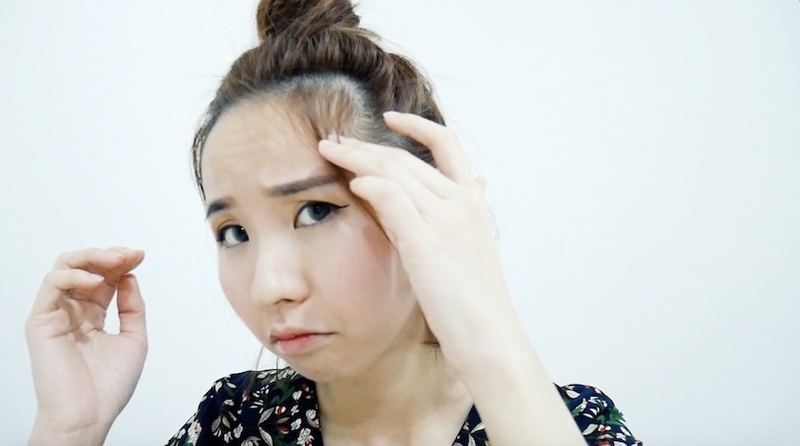 It's really a good solution for people who has thin hairline / empty spot like mine. In addition, the powder itself has a sebum control effects. Just like the oil-free powder for a fresh and oil-free scalp. Hope this review is helpful for you. That's all for my review and I will see you on my next post. Love, xoxo. #Extra:- Here's the video to show you the how-to-use tutorial <3 Love xoxo. What a useful product! thanks for introducing this to us :) will go and get it once it is available in Sabah. Hi Chanwon, I would like to ask is this like a makeup product that has to be properly removed by a makeup remover at the end of the day? Or it's like a skincare product where I just apply and doesn't require proper removal? Thanks for answering my question, and if you already answered in the blogpost, I think I might have missed it. Normal shampoo can remove it already ya. So no need purposely remove it with makeup remover. Easily this fabulous website may perhaps irrefutably be well-known within many blog persons, a result of the conscientious articles or reviews or perhaps opinions.